Fulfil your dreams when you enter the enchanted forest filled with pixies and fairs in this online 5 reel mystical adventure. 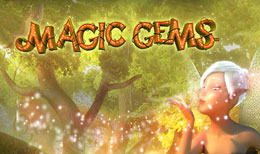 Offering an enormous 40 pay lines, Magic Gems is accompanied by a soothing soundtrack, toadstools, green trees and endless free spins. NextGen Gaming is an experienced developer of successful slot games for online and land-based markets around the world. Since 1999, they have continued to test the boundaries of innovation. Anchored by a common goal and ‘NextGen promise' to our teammates, customers, and players: “To always strive to create games that deliver extraordinary entertainment and quality – with integrity and in collaboration with our partners.” It's an ambitious promise that, to date, they haven't broken. Some forests are dark and foreboding, even in day light. Now enchanted forests are different. Happy toadstools spring fourth, coloured flowers flourish and dusted rays of warm sun show the way. Oh, yea, this place is different and if you go further... you'll find Magic Gems and fairies. This is the sumptuous slot, Magic Gems from Next Gen Gaming. Complete with a mystical soothing soundtrack, you'll fall in love on sight! You have to opt for full-screen play! Here we have five reels roped off with green vines and set against a transparent background allowing us a good view of the expansive forest and animated graphics. There are a whopping forty fixed pay lines. Bets begin at 40 pence up to £20 and you choose your bet from the list provided in a handy pop up panel. Beneath the reels are the information boxes, your total bet, and winnings. But, on the right floats a beautifully rendered animated fairy. Listen to her wings flutter as she hovers close by watching the spins and blowing handfuls of fairy dust now and then. She celebrates your wins too and has some snazzy moves! The carefully chosen symbols decorating the reels include: various gems, representing the high values and playing card values, Nine to Ace, presented in a green coloured font, detailed with creeping vines. These are the lower payouts. The cheeky smiling fairy is the wild and she can swap out for all others bar the bonus icon. This is a treasure chest and it appears on reels one, two and three. A handy addition if you click on the card or gem symbols a box opens with their win place details. Free Spins are triggered when you land the treasure chests anywhere on reels one, two or three. You are awarded ten freebies here. Another great feature is exploding lines. This is when winning combos literally explode making way for new symbols to fall into their place and possibly create further winning combos. They can go by other names such as collapsing reels or rolling reels. The wild, however, remains in position. The winning lines keep going until no more combos are formed. This will send Tinkerbell wild! The title and visual immediately suggests a slot for the girls, but, if you are a guy and you pass on Magic Gems, you are going to miss out. Don't be fooled by soothing sounds and pretty graphics, this slot packs some heat in the features and overall prize department. On a 20.00 bet, the exploding reels feature netted me a cool 25.50 a second time I won 37.00 - all in all not bad. Beautifully rendered and well produced, Magic Gems is a winner. It should attract all kinds of players, beginners, and high rollers. It's great to play, look at and the bet settings are very attractive and reasonable. This is what you would expect from a company like NextGen and it's a must have on the favourite list.